The number of international students pursuing higher education in the United States has risen to 1.18 million, up 2 percent from March of last year. 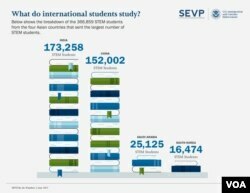 That's according to a new report on student data, released this week by the Student and Exchange Visitor Program, or SEVP, which is a unit within a division of Immigration and Customs Enforcement. The report says the majority of those students, some 77 percent, come from Asia. - The largest number of international students comes from China ((more than 362,000)) and India ((nearly 207,000)). - Nepal saw the largest proportional increase, 18 percent. - Saudi Arabia, which had a 19 percent decline, continues to have the fourth highest number of students studying in the US, at nearly 56, 000. - Some 514,000 international students, or 43 percent, pursued science, technology engineering or mathematics ((STEM)) degrees. - 49 percent of Asian students are pursuing a STEM degree. - The majority of those are from India. Some 84 percent of Indian students in the U.S. are studying STEM. - California, New York and Texas have the highest number of international students. - The distribution of international students is about even throughout the country’s four main regions - Northeast, South, Midwest and West. The report, "SEVIS by the Numbers" is based on information collected by the Department of Homeland Security, of which ICE is a part.